Wow! That's really interesting! I have several reasons for posting photos on my web site and Facebook, but not once did I intend to be a poster child for growing old. However, if my life as presented through my web page and Facebook truly did take away the fear of aging, then that makes me happy. She's right. I am not afraid of the years stacking up - dismayed sometimes that they go by so fast, but not afraid. I suppose I live my life the same as I did twenty, thirty or forty years ago and that is what shows in my writing and in the photos. That too, will change in time, but I will adjust. I do not connect with any Facebook people I do not actually know or consider a friend. I might have to rethink that, especially since my German friend tells me I made her break her own rule about only adding people she knows in real life when she contacted me! Although I believe that the only one who motivates me must be me, sometimes my focus slips a little. Working by myself as I do, preparing three year old futurity horses in less than ideal conditions then competing against reiners with indoor arenas, it's possible to get discouraged. Then I need a push to get on track again. Early in the winter of 2009, in my snow blanketed arena, I started riding my two year old stallion, Walking With Wolves. I knew I must start him if he was to be ready for 2010 futuries. Schooling was sporadic and somewhat dangerous to both of us in the icy outdoors but, by spring, he had a few rides on him. He was a handful, though - a young stallion with a mind of his own! I struggled through bratty behaviour until, by fall, he had leaped ahead in his training to a point where I thought he had caught up to those who had had the advantage of indoor arenas. Then winter arrived in December (Boy! Did it ever!) and he had a whole month off. "Not a problem." I thought. "One month off is okay." In January I started riding him again. He had regressed, mostly in the "attention span" area and now I could not do as much with him. Since I was using only one end of the arena, I was restricted to one big circle and everything I could do on that circle (I can be very inventive!). Still not discouraged when the circle got icy, I changed to the snowy end of the arena. Of course sliding plates were out of the question, so my now-three-year-old reining prospect had not yet stopped - really stopped and slid - and he wouldn't for some time. That's the way training continued for January and half of February, when riding came to an abrupt halt. Unusually warm weather had melted enough snow that water ran across my arena . . . and froze the next day and stayed that way for two weeks. Now I could not ride at all. In March, my arena still not usable, I started riding the young stud down my sandy road, which had bared off. Of course I was more limited than ever on what I could do, but at least he was back under saddle. But how was I going to have him ready for reining futurities five months away? My confidence and, along with it, my focus and motivation, slipped a little... That's when an unexpected push in the right direction came from a reconnection with an old friend. Vern Sapergia, my mentor of years past, agreed to teach a clinic at my place! It was exactly what I needed. One day I was frustrated; the next I was pumped and ready. What a difference a day makes! With renewed hope for my extremely talented, but woefully behind-in-his-training futurity prospect, I am again motivated to be the best we can be when we enter the pen for the first time in August. Vern's clinic is slated for April 16-18 at Wildwood Reining Horses. It will be like old times, riding all day and chewing over the day's events in the evening. I can't wait. "Beware the Ides of March," a soothsayer warned Julius Caesar and so forever changed March 15th from simply a day on the calendar to a statement of doom and gloom. Most of us familiar with that pre-assassination warning to Caesar in 44 B.C., but how many are aware that the Ides of March is just one of a dozen "Ides" that occured every year (one per month to be exact) on the Roman calendar? But the Ides did not always fall on the same day. In March, May, July and October, the Ides was the 15th, in the other months the 13th. The first of the month was called the "Kalends" and the 7th of the month was called the "Nones" . . . but only in - you guessed it - March, May, July and October. In the other months, the Nones was on the 5th. From these three special days - Kalends, Nones and Ides - the Romans identified all the other days by counting backwards using - what else? - Roman numerals. So dates looked like this: March 1 - Kalends, March 2 - VI Nones, March 3 - V Nones, March 4 - IV Nones, March 5 - III Nones, March 6 - Pridie Nones (Guess it was too simple to stick to that plan so they used "pridie", which means before), March 7 - Nones. If you have been paying attention, you will see that the above identification with roman numerals doesn't quite work out. That's because the Romans counted "Nones" as the first count backwards. So the inventor or the Roman calendar (reputed to be Romulus, but no one knows for sure) organized each month around three days, a simple enough concept fraught with complications! What was he on? Back to the Ides of March 44 B.C. Later that fateful day in Rome, Julius Caesar saw the soothsayer again and remarked, "The Ides of March have come." to which the soothsayer replied, "Aye, they have come but not gone." And then Brutus and his buddies assassinated Caesar. Guess he should not have been so smug. What has this got to do with anything? Probably not much - just a bunch of useless information. I can't think of any way it relates to us today, unless it is to remind us that these sort of things still happen . . . and not necessarily on the Ides of March! Caesar did us one big favour before his untimely death. In 45 B.C. , with the aid of astronomer, Sosigenes of Alexandria, he introduced the Julian calendar we use today. The Roman calendar is forgotten except, thanks to Shakespeare, on this day when many exhort the perils of the Ides of March. Maybe we should adopt another day, a happier one. How about the Kalends of January (New Year's Day)? 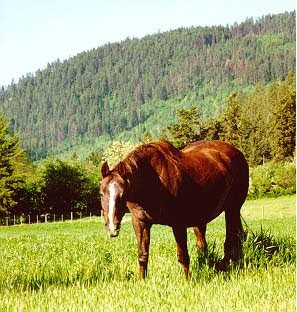 In 2002, I wrote a short article about Duchess, a mare I had just lost. I called it "One Good Mare". One good mare had founded a dynasty of good horses. One good mare had been with me 34 of her 36 years on this earth. One good mare had left an impression on me that would last a lifetime. When I penned that little piece, I thought the phrase would apply to only one mare in my life. I might have to rethink that. I bought Peppy Del Cielo in 2000 as a yearling and promptly named her Prima (She would always be first!). She was a untamed little thing and we had a few arguments. She didn't want to be caught and she had no intentions of letting me pick up her feet. Several days and mutiple patient lessons later, I could do anything with her. Everything about Prima screamed reining - her breeding, her conformation, her willingness to please. I had great plans for her . . . but it was not to be. 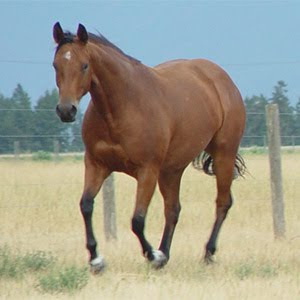 In the fall of her yearling year, she developed a neurological condition caused by a parasite. Thankfully, with drug treatments and many hours of my own brand of physical therapy, she regained her coordination and I trained and rode her but, after careful consideration, I decided not to show her. She had not made a complete recovery and I was not confident that she could stand up to the rigor of reining shows. I turned her into a broodmare. She would take the long way to prove herself. She would have to produce horses that perform. No problem. If statistics mean anything, Prima's 2009 filly, Wildwood Mistral, has a 100% chance of excelling in the reining pen. I hope she sells to someone who will promote her. But then again, why wouldn't they? I didn't breed Prima last year (go figure...), but in 2011, with three of her progeny competing in reining derbies, she will drop yet another well-bred, drop dead gorgeous, athletic foal. She deserves the same tribute as Duchess because . . . she is one good mare. The 2010 Olympics may have had somewhat the same effect on Canadians. As the Olympic flame made its way across Canada, it generated an infectious energy until, in Vancouver, almost every Canadian wanted to be part of it. Sitting at home in the Chilcotin with no possibility of attending, I did not expect to feel connected to the excitement, but after the opening ceremonies that was nothing less than magical, I was hooked. As the games unfolded, Canada came together as a nation in a way no one expected. In the throes of a depressed economy, Canadian athletes and fans alike needed to believe… and they did. The 2010 Olympics have been our Seabiscuit. We rode along with every athlete. We felt their glory. We felt their pain. And now, we celebrate a Gold Medal record. Next step – reining an Olympic sport. 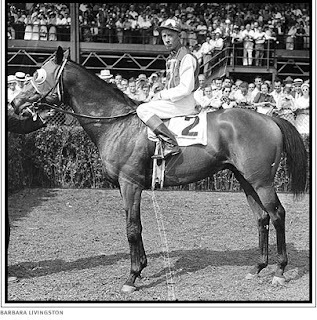 Remember Seabiscuit. Remember the 2010 Olympics. If we can believe it, it can happen. Congratualtions to all the Olympic athletes. Mission accomplished and job well done!